Heads up Ice Road Truckers. The future is at hand. 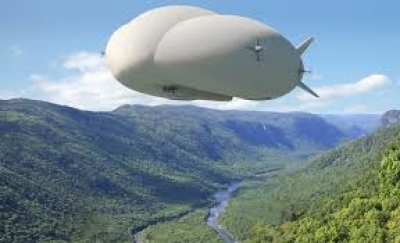 STRANGE LAKE, QC-Mining company Quest Rare Minerals and Straightline Aviation have announced that sometime between now and 2020, they will ship ore concentrate, supplies and personnel with Lockheed Martin’s helium-filled hybrid airships. A fleet of seven airships will link Quest’s Strange Lake mine site in Northern Québec to Schefferville, which has a direct rail link to the port of Sept-Iles. The LMH-1 airships will also transport personnel, critical supplies and more than 200,000 tons of rare-earth ore annually to Quest’s Bécancour refining facilities. (Rare-earth metals are critical to hundreds of high-tech applications.) One airship can carry up to 20,000 lbs of freight and 19 passengers. According to a statement from Quest, the LMH-1 is well suited to Quest’s transportation challenges due to its remote northern Québec mine site location. The helium-filled airship can land on virtually any surface, including snow, ice, gravel and even water, with no runways or other expensive infrastructure required. Both the U.S. Federal Aviation Administration (FAA) and Transport Canada have agreed on the newly developed Hybrid Airship certification criteria and the first commercial deliveries are scheduled in 2019. Helium provides 80% of the lift, while the remaining lift comes from the aerodynamic shape of the aircraft and its four thrust vectoring engines. The airship also features a unique hovercraft-like Air Cushion Landing System that facilitates taxiing and grips the craft firmly on the ground. Quest says the LMH-1 is not only designed to use less fuel, emit less carbon dioxide and produce less noise than conventional aircraft, it also eliminates the need for costly ground-level infrastructure, avoiding impact on the area’s wildlife habitat compared to road transport and trucking along a road corridor to the Labrador Sea coast. The 10-year service agreement that starts in 2019 represents a value of approximately US$ 850 million, with further extensions of up to 20 additional years in line with the current projected life of the mine.